This week, my family is hosting a couple of young soccer coaches from the U.K. Grown but still growing, they eat full plates of food, come back for seconds, and can’t get enough orange juice. Half the fun has been figuring out how to feed them. Creating good content is like cooking for new guests. They might not want Bangers and Mash – what do they want as “published” content? 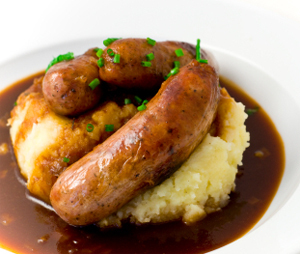 Instead of offering up bangers and mash, I initially asked what they couldn’t stomach. We’ll LIT’rully eat whateveh you eat they said. Nobody means that. Be it food, writing, or any other consumable, people just aren’t always clear on what they want until you offer something they don’t want. Case in point: For my guests’ first breakfast, I made fried eggs with sprouted bread, red onion, and tomato. The bread wasn’t a hit, and one of the boys left the onion and tomato untouched. Lunch went similarly. Half the work comes after you make the meal. One loves Clif bars. One takes coffee with a pinch of milk. The other takes two sugars. They’re impressed by our ice cream. Onions are a hit, tomatoes a miss. Peaches they could take or leave, unless baked into a pie. Neither reaches for salt. Mexican food is gold. After just five meals, I know much better how to feed our new guests. It’s not rocket science: Both leave food they don’t like and take seconds of what they love. I merely paid attention to their consumption habits. With content as with cooking, that’s half the battle. Play it safe before you tweak. If you don’t know what’s getting left on the plate, you won’t know what to stop making. Continually watch responses to your published content, and consult with those who can tell you what the numbers are really saying, and which ones matter. Remember, too, that social media metrics can be sketchy, so not all monitoring can be done with a bar graph. Once you’ve got a decent handle on which content is flying, don’t be afraid to experiment with new ideas that are consistent with your brand but new for the palate. Because—as with that ranch dressing!—people can’t fall in love with something new if nobody ever offers it to them. But they might not try something new until they’re sure they can trust you. When new guests arrive from elsewhere, they want to experience what you have to offer. Without so much as a word, they’ll tell you what they love. Get cooking and figure out how to make them want to come back for seconds!